It is fast, simple, easy and we will even give you a FREE marketing manual to show you how to attract more clients. 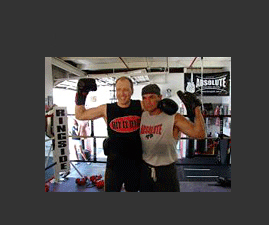 Work with former title contender and Boxing Fitness pioneer Tony Spain. A DVD of ordinary people and professionals showing proper stance, punches, combinations, and workout routines. You get a DVD with short, easy-to-follow video clips of over 30 different routines (that’s about 90 minutes of video), so that you can quickly learn and teach them. There is also an addition 114 still photos showing precise technique. 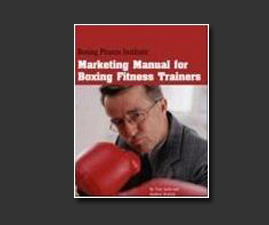 A Boxing Fitness Manual with photos and step-by-step instructions. This manual includes over 150 still photos and breaks down exactly what you need to do to run a successful program. An ADVANCED program manual with photos and step-by-step instructions. This manual includes over 150 still photos and breaks down exactly what you need to do to run a successful program. 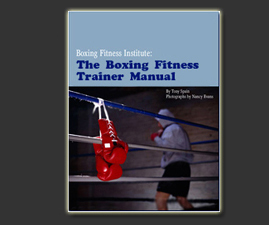 INCLUDED - Basic Boxing Fitness Certificate documenting that you are a Certified Boxing Fitness Trainer. 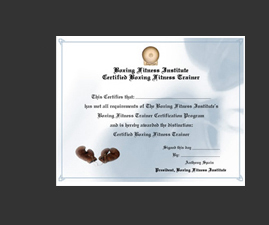 Then you receive an exclusive ready-to-frame 8" X 11" Certificate from the Boxing Fitness Institute documenting that you have mastered the material and are a Certified Boxing Fitness Trainer. One year of telephone and email support from Tony Spain to assist you with your Advanced Boxing Certification and Training sessions. One-on-one, personalized consulting. With this system, you have access to Tony Spain's advice and guidance 24 hours a day, 7 days a week. Ask Tony any question you have about boxing fitness via email, and he will respond personally, usually within one business day. It is fast, simple, easy and we will even give you a FREE marketing manual to show you how to attract more clients than you have before. Now Approved for 20 Units of CEUs from ISSA.